While working on my One Room Challenge I got to thinking about what areas of the kitchen are important to me and what "stations" I needed to create and tidy up. If I'm being honest here the two areas that were at the top of my list was the bar and the coffee area. I really should just have two IV stations set up. Just kidding. Not really. Anyway back to the point, with limited counter space (more like none) giving up even a small area must be for an important reason. Luckily my Nespresso machine takes up little space. Even so everything I need should be within reach. Sugar, the pods, cups, etc should all be right there. 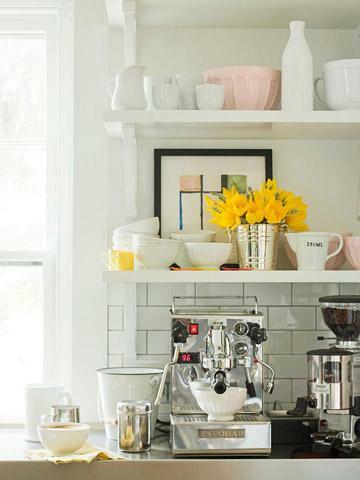 Martha Stewart's coffee station, might be my favorite ever. I'm green with envy over her kitchen. This one is built in, so fancy. But that little tray below is adorable. 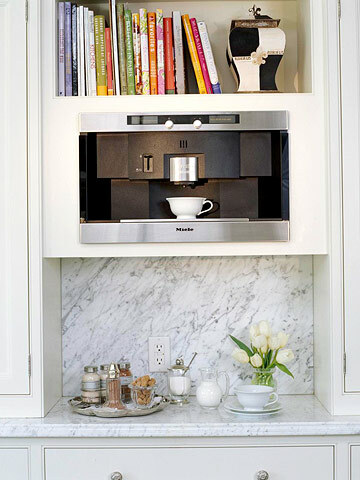 Maybe one day I'll have my own Miele espresso maker built into my cabinets. One day. Tell me, what are your important stations in the kitchen? I like the first one the best...it's so cute. There's something about smaller and less fancy that I like better. Oh that Martha. She's got a future I think. 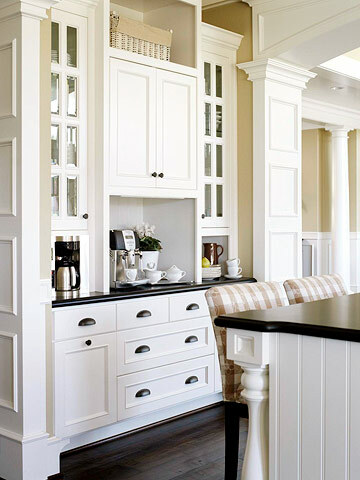 :) I would LOVE a coffee station in our kitchen. I don't drink it but my hubs does and leaves his coffee crap everywhere. One day, when we have more space this is going to be a must have! 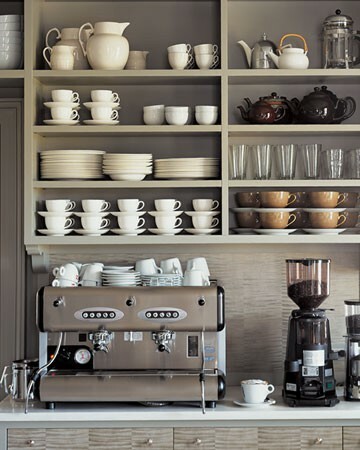 Coffee & bar are obviously my top priorities too :) I dream of the day when I have more than 2x2 feet of counterspace!! Have you ever priced those suckers? Seriously....crazy money. I looked into it, and could not justify the cost. I bought the Nespresso frother, and I am good to go. 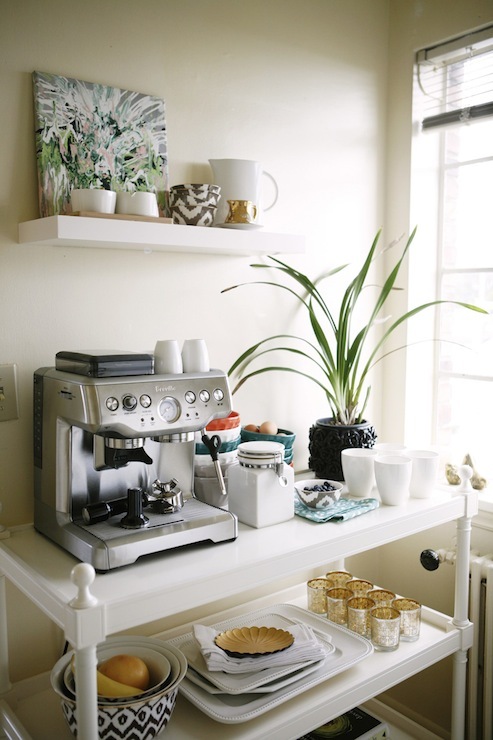 Coffee stations are very important. Now you have me wanting to do something with mine. Gosh those are all in my "one day" file now! And considering my husband drinks 4 cups of coffee every morning, he would agree! Definitely I like the atmosphere and style of following kitchen photos, I'm truly impressed from it when I see kitchen design using interior glass doors. Thank you!